Things That Make You Go WEEEHEEEHEEEHEEE! Remember a couple posts back when I was screaming and ranting about my photobucket account not working? Coie fixed if for me. Gee, she’s the swellest. Spring. Ha. Actually, it now already feels like summer. It was nearly 90 yesterday. That’s way too bloomin’ hot. 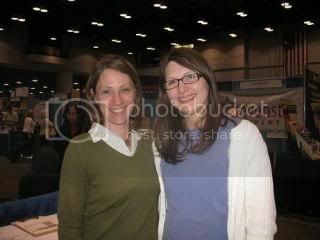 And now since I can post pictorial stuff… Look, here’s EEEEMommy from the Cinci convention. I think I scared her, though. Marshie was making fun of me because every time Angel came around I was like, “oooooh, you’s puh-retty”. She IS though. She was downright gorgeous. And I like her trendy glasses. Pictures don’t do her justice. 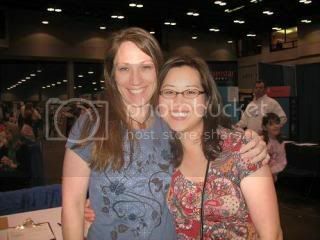 And here’s a picture of my pal, Julie Park. I’m so nice to post this picture, especially after the monstrosity of me that she slapped up on Facebook. She’s so deucedly tiny. I look like an Amazon next to her. What a lucky momsie am I.
I’m so bummed that I missed the picture of you on Facebook! That is a great swing! Oooh! That’s a big big swing. You are so spoiled! Yes, Angel is soooo purty. have to agree there. Mind you, all you girls I met last weekend are SOOooo puhrty. just don’t make that face. Btw, do you know that the link to the Kingdom’s dawn books is not working any more? And, I just want everyone to know that I totally totally, humbly kicked your hiney on Wordtwist. Humbly. oh you’re wearing your groovy wooden butterfly necklace in those pictures… that’ll make Charley feel speckal. very meatballish. What a blessed life you lead… so when you coming over….? Just accidentally came across this and thought of you. Wondered if you’d seen it. Maria: I am coming over as soon as I get my dumb power steering fixed. I miss you SO much. Plan a party for this Friday, yes? Jen G — that is SO cool! No, I’d not seen it. How funny! I LOVED catching up on your blog!! 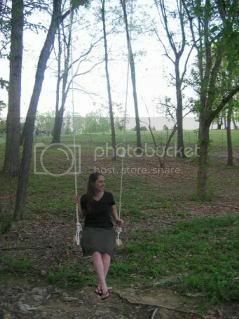 What great pics and I LOVE that swing!! :) Does Emmi the builder contract out?? Emmiko built an amazing swing!! And it looks like it swings straight too! I think I could learn a thing or two from her. it does swing straight… and high! but I still love the swing seat you made me, ChaCha. I was on it yesterday watching the kids play. ooooh, I’m a little green that you got to meet all of those awesome peeps. and I’m waaaaay green that they got to meet YOU. Love your swing girl. I would be spending a zillion hours on it if’n I were you. What a great swing! I want that. I think I’ll have David make me one… although I greatest swinging tree got knocked down during Ike (but fell away from the house, which is tremendously better than falling on the house). David is currently busy building a pantry… so maybe I should make him a list so he doesn’t forget about my swing. Hey, I got my Rosetta Stone. Can’t wait to try it out to see all of the changes! I am really glad I got to see you and Coie. Seriously though, next time we need rooms next to each other. That way I can harrass you more readily. Or be nice and give you chocolate or something. Yes you ARE ‘lucky’ AND blessed! Oh, I’m so jealous! People connecting without me! wish I could have been at the convention too! How can you stand being around all those books and not emptying your bank account at those conventions?? I would have a HARD time. That is an AWESOME! swing! I bet it swings nice and long, slow and graceful! What a good daughter!